As we move into another new year there are once again a new set of predictions, hopes and concerns as to the direction of digital marketing over the next twelve months and beyond. There are so many exciting developments set to take place and I’m really looking forward to seeing how these take hold in 2018. One of the interesting areas I’ve observed across many trends is the recurrence of two themes: artificial intelligence (AI) and machine learning. These two closely related subjects seem to be taking hold across a number of areas, including marketing automation, digital creative, personalization and marketing technology. However, it’s the influence of AI and machine learning on the future of search that I’d like to explore in some detail in this article and the potential implications on business and marketing. All indications are that the decade-old content discovery model will be disrupted when search engines move away from directing visitors to websites and instead directly answer users’ questions. For many people, search engines will become ‘The Web’, in that they will not leave the interface since their questions will have been answered as a direct result of their search. These developments show how search is evolving and adapting to new cultural trends and consumer behaviour. 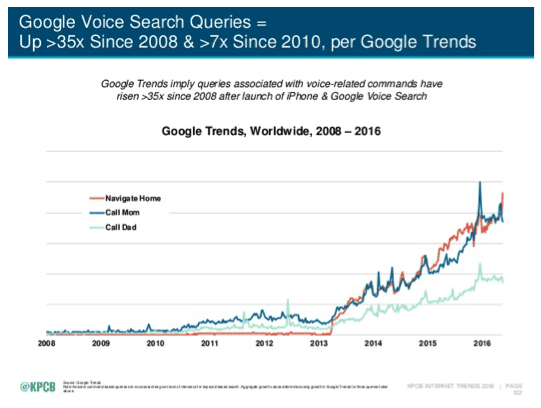 However, the future of search will be more than just voice which is why the evolution in this space is becoming increasingly more interesting. 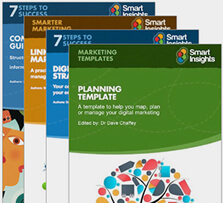 Whilst there are similarities and overlaps between each of these three areas, there are also distinct differences and implications for marketers and businesses alike. “Someday, pulling your mobile out to search will feel as archaic as a dial-up modem.” - Amit Singhal, Senior vice president and software engineer at Google. Voice search is by no means a gimmick. 55% of millennials use voice search once a day and the rise of voice assistants, such as Google Home and Amazon’s Echo, voice has now entered the mainstream. To ask your device for something, in plain English, and for it to give you the answer you were looking for, is a big step for the technology underpinning voice search. And this is not just about voice recognition - it's about the ability to "read" a sentence and know what you're talking about. It started with IBM's Watson, which was able to fake "knowing" English well enough to win at Jeopardy, before the idea hit the mainstream with Apple's Siri virtual digital assistant, paving the way for Google Now, Microsoft's Cortana and of course Amazon’s Alexa. The implications of this insight is that content must be viewed through the prism of both text and voice and therefore content creators should keep in mind the conversational nature of voice searches and how this influences longer phrases. Develop questions that searchers may ask and make sure you have content that answers those questions, e.g. adding Q&A content to your site, FAQs etc. A personal assistant is essentially a device that is seamlessly present wherever you are, so easily accessible that you barely even realize you're interacting with a computer. 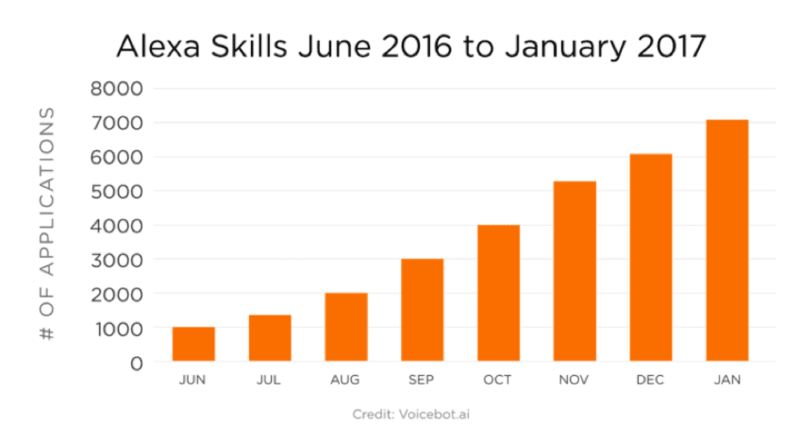 Amazon’s Alexa and Google Home are examples of mainstream voice assistants, and VoiceLabs estimated last year that 24.5 million voice-first devices would be sold in 2017, meaning more than 30 million total voice-powered intelligent assistants in US homes by the end of the year. As technology advances, personal assistants will perform searches in the background based on information they pick up from conversations, consumer location and even biometric information. They will take into account a consumer's daily commute schedule and use real-time traffic data to recommend when they should leave home to make it to work on time. Personal assistants are already combing through emails and apps to produce info cards showing upcoming flight times, purchased movie tickets or incoming package shipments, so there is certainly scope for further development. Google, Amazon, Microsoft and Apple are all working on optimizing their artificial intelligence so that instead of you asking the questions, the assistant will ask you questions to help organize your life. It will remind you of appointments, advise on life choices and come close to being a truly advanced artificial intelligence. The challenge for brands over the next three to five years will be how to effectively surface their content in these new environments. According to some sources, more than 50 billion devices will be connected to the internet by 2020. Whilst this number has been disputed in some quarters, it is difficult to argue that we will be much more connected within the next five years meaning search will become increasingly ubiquitous in our lives. It will no longer be contained within a search engine results page on a screen. Within the search space, Google is still the clear leader with 74% market share versus rival providers. However, Google is by no means the only key player anymore, especially when we consider the way in which search is evolving. Many competitors have grown formidable search and discovery platforms, most notably Facebook, Apple and Amazon with the introduction of new search and discovery platforms and the testing of new applications. 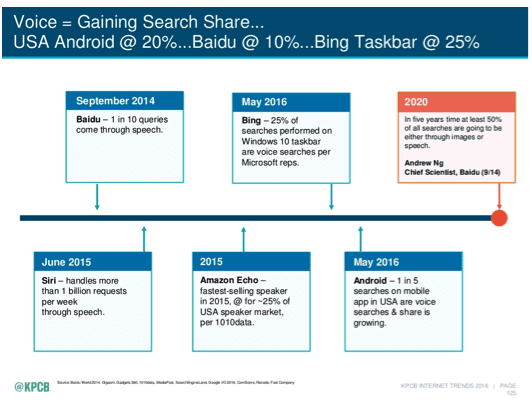 With less screen estate on devices, the utility of the search browser is greatly diminished. As a result, where the information results page was once a campaign map to be augmented with paid search, we will begin seeing an even more heavily curated set of results. One possible implication is that brands with the biggest pay-per-click budgets and programmatic capabilities may quickly rise to the top. Facebook Search is now a powerful search engine used by over one billion people every day. Facebook has extended the platform to support natural language search across all content and offers an unrestricted view of the recommendations from your social graph. For example, if you searched for “Thai food”, you will be presented with a collection of places and also posts from friends and public posts from across the Facebook network. Search results are by definition personalized and based on the privacy settings of participants. 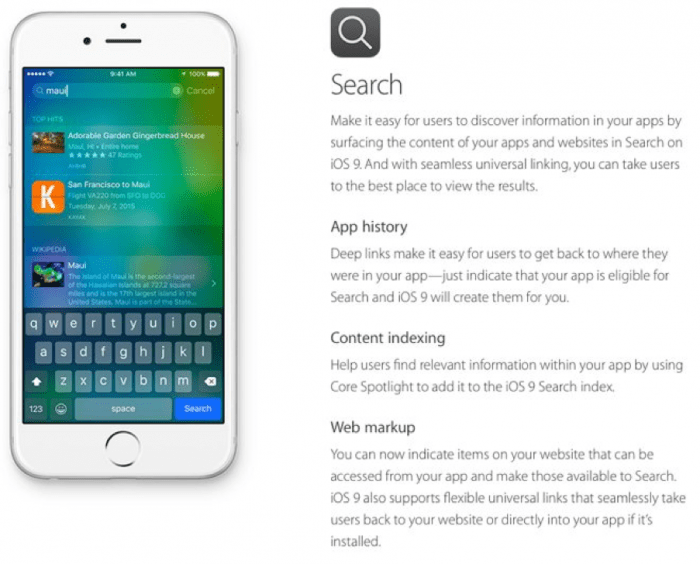 Apple has sold over 700 million iPhones during the last eight years and Spotlight has very quickly become a very large search engine. Apple has been progressively expanding the scope of their search. In 2015 with the release of iOS9, they exposed results from a number of third-party services including Wikipedia, YouTube, Amazon, and Netflix. 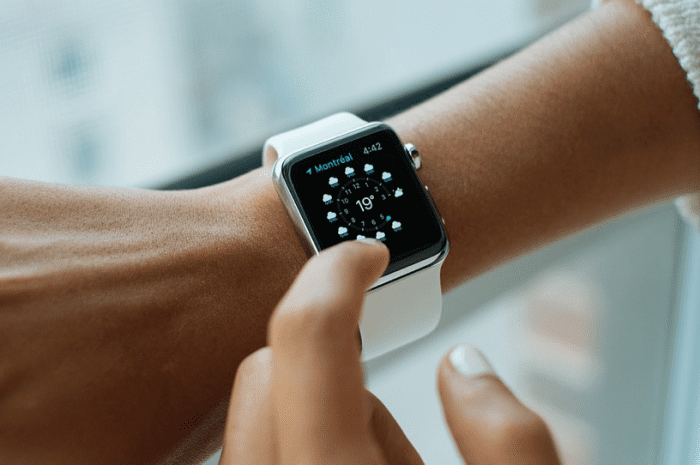 More recently they have allowed consumers using iOS devices to issue voice commands to Siri, Apple’s personal digital assistant, to run search queries. Search and commerce have always been closely connected, especially since the advent of Google’s AdWords in 2000. However, the evolution of search beyond Google and across many other different devices and platforms as discussed above mean that commerce has evolved too, offering consumers to connect with brands and buy online. According to a study from BloomReach in 2016, 55% of US shoppers made their first search on Amazon, up from 44% in 2015. Amazon has introduced a CPC search advertising product that provides brands with high visibility placements across the Amazon website and mobile app. Amazon is continually working to optimize their site experience and this is a key factor why consumers often leave other retailers’ sites (55% of US consumers have left a retailer's site for Amazon after having a poor site experience). Amazon is already exploring ways to tap this visual language for search. The Amazon Firefly App, for example, utilizes users’ smartphone cameras to identify products and then performs a search for that product. eMarketer expects visual search to become a mainstream tool for retailers within one or two years. The future of visual search is more a question of when, not if. For brands to benefit from visual search, they will need to improve their ‘visual dictionary’. Visual search technology is already with us but the biggest challenge right now is the limited image library. In addition to this, brands need to expose their visual dictionary to the search engines. New shopping ad formats allow users to swipe, revealing information including product ratings and availability at a nearby store. Expandable Paid Search ads drive more qualified traffic directly to retailers. On searches for top-rated products, such as “Best women’s Nike running shoes,” Google is now showing newly-designed shopping ads with authoritative rankings and product ratings. The new design is so helpful to those specific users that Google has seen click-through-rate increases of up to 11% for these queries. 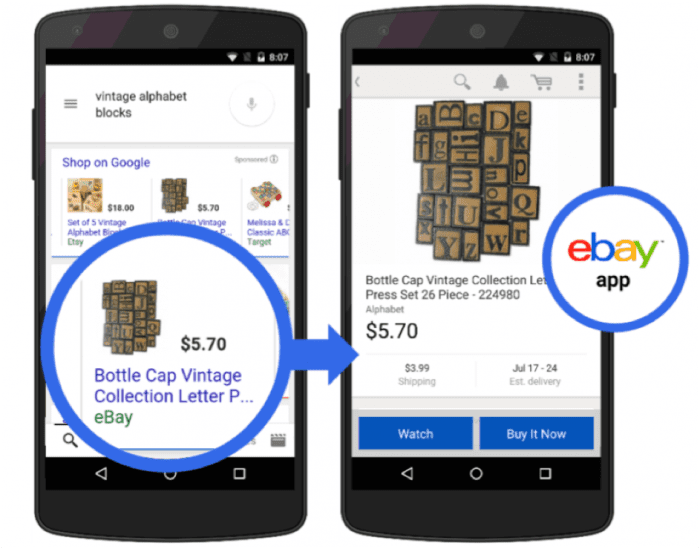 Google have added a ‘buy now’ button to their paid search ads that are linked to partners apps to enable consumers to purchase from the search listing instead of their website. This is a tremendous new opportunity for retailers and app developers to drive engagement with their shopping apps.